In 2013, Greg Kramer’s Sherlock Holmes was an award-winning sell-out hit for Montreal’s Segal Centre. After a preview engagement in Los Angeles, Starvox Entertainment and June Entertainment have launched the show’s North American tour in Toronto. How long that tour lasts will be an interesting question because based the evidence of its gala night on October 28, the show is a complete disaster. Not only does the plot Kramer has devised make no sense, but director Andrew Shaver has no clue whether the tone of the piece is farcical, serious or camp. On top of that the acting of much of the cast, worst of all David Arquette as Holmes himself, is atrocious. A charitable suggestion would be for the producers to cut their losses now and cancel the tour. How is it possible to get a character wrong who has been etched in the popular consciousness for over a century and has found renewed vigour in modern television iterations like Benedict Cumberbatch in Sherlock or Jonny Lee Miller in the American knock-off Elementary? Kramer, Shaver and Arquette demonstrate that not only is it possible but that the results can be painfully embarrassing. Whether your favourite screen incarnation of Holmes is Basil Rathbone, Jeremy Brett or Benedict Cumberbatch, the hallmarks of Holmes are at a minimum high intellect, uncommon precision and great intensity. David Arquette conveys none of these qualities. He plays the role and delivers his lines haphazardly. He adopts a Raj-style British accent usually indicative on stage and screen of pompous buffoons. He punctuates this with girlish giggles, presumably to make Holmes peculiar. Rather than moving about the stage with feline stealth, he flits about like a gerbil. To make things worse he frequently fumbles his lines. By the end of the play, he was looking to other actors to finish his lines, feed him new lines or correct what he had just said. It’s shameful that the actor of a title role in a big production is not word perfect even after a run of previews. A great performance in the title role would certainly improve the show, but it would not resolve the inherent flaws in the writing and direction. Greg Kramer, who died in 2013 just as the play was to begin rehearsals, has deliberately tried to include as many reference to the 56 Sherlock Holmes stories as possible. One might applaud Kramer’s ambition, but it has led him to concoct a plot that ultimately does not make sense. In brief, a body is discovered on a London pier having been fished out of the Thames. The London police who seem completely unable to do their own work, immediately call in Holmes. Meanwhile, the lovely Lady Irene St. John (Renee Olstead) comes to visit Holmes to report that her husband, Lord Neville St. John, has been kidnapped. Lord Neville has been a vigorous opponent of Britain’s opium trade with China. Holmes instantly assumes that the villainous Colonel Moran (Graham Cuthbertson) is the kidnapper, that both crimes are connected and that Holmes’s archenemy Professor Moriarty (Kyle Gatehouse) is behind it all. In order to give a woman a more active role in the story, Kramer has Holmes and Watson (James Maslow) allow Irene to help them in their sleuthing. Rather than seek any evidence, Kramer has Watson and Irene, disguised as a man, visit Moriarty directly at his club and accuse him of the crimes. This, as one might imagine, comes to nothing. After a foot chase through London, train journeys to and from Lord St. John’s family pile in the country and a hansom cab chase back in London, Holmes is able to implicate Colonel Moran, but not Moriarty. From information Irene reveals at the end, anyone who has actually tried to follow the mishmash of a plot will realize that it makes no sense that her husband, during his kidnapping, would ever have told her to seek Holmes’s help in the first place. A nonsensical plot and the inability of Holmes’s famous powers of deduction to solve the mystery are already two major blots on the story. A third is Kramer’s depiction of the London constabulary as a pack of idiots. The first scene of the play has a bobby sing a song about how proud he is to have a whistle, which leads us to wonder if this is meant to be a kiddie show. Usually, calling in Holmes is the last step the police take when a case stumps them. Here they call him in first thing when they discover a murdered man. Inspector Lestrade (Patrick Costello) is meant to be plodding and narrow-minded, but Kramer makes him out to be as doltish as his underlings. The problem with this is that debasing the London police also debases Holmes’s abilities. Holmes is meant to solve the crimes that ordinary policemen cannot. Here he comes in to solve a crime they haven’t even investigated. The problems of an inadequate actor starring in a poor script is exacerbated by Andrew Shaver’s incoherent direction. To show a chase across London to a train station, he has the cast run back and forth across the stage into and out of the wings, including the limping Watson, as if they were in a children’s panto. He has Holmes show Lestrade how to walk through a crime scene by tip-toeing and pirouetting as if he were a ballet dancer. He has Holmes discover the trajectory of a bullet by falling down on a dead body (ha ha). And yet, later when he has Watson upbraid Holmes for the detective’s drug habit, Shaver has the scene played as completely serious. In Act 1 Shaver twice has the cast walk about in a jittery fashion while the lights flicker as if they were in a silent movie. Since the action takes place in the 19th century after the Second Opium War (1860) and during the reign of Queen Victoria (1837-1901), silent movies had not developed to the point where they can be a useful reference point. In any case, why have the cast only periodically imitate them or imitate them at all? In Act 2, Shaver decides to have the whole cast, headed by Moriarty join in a big dance number. Why? Who knows? One gets the feeling that Shaver is throwing any idea to hand at the show hoping that something sticks. Even James Lavoie’s costumes are peculiar. He gives both Watson and Moriarty pork pie hats which are from the 1950s not the 1880s. Lady St. John has supposedly travelled from the country to London. Yet, rather than having her wear a travelling costume, he has her clad in a ball gown throughout the show. She supposedly has been tramping through mud to find her husband, but there’s evidence of that on her shoes but not her gown. When Lady St. John disguises herself as a man, he has her wear tights and a push-up bra under her swallow-tail coat, thus emphasizing that she is a woman. Is this supposed to be a joke? Or is the designer pointing out Lady St. John’s idiocy? Small screen stars James Maslow and Renee Olstead could not be unluckier in their choice of vehicle for their stage debuts, yet both acquit themselves far better that the experienced Arquette. 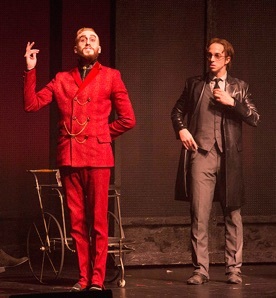 Indeed, Arquette tends to use the Watson of the good-looking but personality-free Maslow as an kind of onstage prompter and repairman to help keep the action from straying too far off track. Olstead alternates between being a typical helpless Victorian female and a strong New Woman without any reason for the changes back and forth. exception of Matthew Gagnon who plays his part completely straight as Constable Rance, a copper gone wrong. James Lavoie’s design involving a series of sliding screens is clever since they allow the video design of George Allister and Patrick Andrew Boivin to change from one location to the another instantly. The most effective scene is one on a train that, thanks to Itai Erdal’s moody lighting and Jesse Ash’s sound design, excitingly travels into and out of tunnels while Allister and Andrew display the huge wheels of a racing steam locomotive on either side of the stage. The trouble is that Shaver allows this scene to go on too long to set up a disappearance that we know is bound to occur. In short, Starvox Entertainment’s Sherlock Holmes destroys what ought to have been a sure-fire idea and is a waste of two-and-a-half hours. 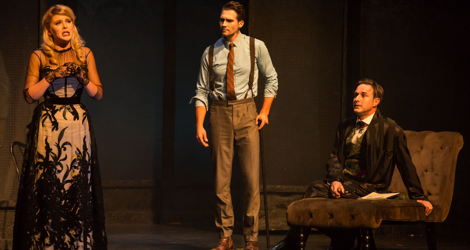 Theatre Aquarius’ 2011 production of Steven Dietz’s Sherlock Holmes: The Final Adventure was infinitely superior to this mess and had an ideal Holmes in the dashing and focussed Geordie Johnson, a sturdy Watson in Ashley Wright and a truly sinister Moriarty in Mark Caven. Starvox founder Corey Ross claims he set out to recreate the award-winning Segal Centre production, but given the weak script plus a different cast and different director, the only award this show would win is worst show of the year. 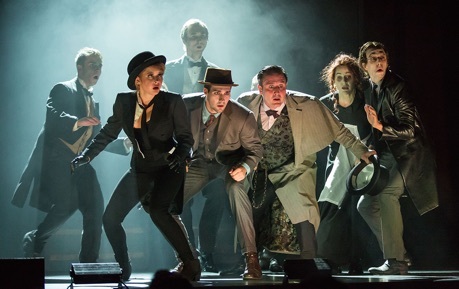 Photos: (from top) Renee Olstead as Lady St. John, James Maslow as Watson and David Arquette as Holmes; Renee Olstead as Lady St. John disguised as a man, James Maslow as Watson, David Arquette as Holmes and Patrick Costello (far right) as Lestrade; Kyle Gatehouse as Moriarty and Patrick Costello as Lestrade. ©2015 Brian To.